Botanical Beach affords visitors with access to uniquely rich tide pools and shoreline trails with fantastic geological features. The extensive variety of marine flora and fauna in this colourful intertidal zone includes red, purple and orange starfish and sea urchins, white gooseneck barnacles, blue mussels and green sea anemones and sea cucumbers. The Botanical Beach parking lot is the western terminus of the Juan de Fuca Marine Trail, located at Kilometre 47. This parking lot provides access to nearby Botany Bay and Botanical Beach itself. Botanical Beach affords visitors with access to uniquely rich tide pools and shoreline trails with fantastic geological features. The extensive variety of marine flora and fauna in this colourful intertidal zone includes red, purple and orange starfish and sea urchins, white gooseneck barnacles, blue mussels and green sea anemones and sea cucumbers. Coralline algae, periwinkles, chitons and sea stars can also be seen at Botanical Beach. 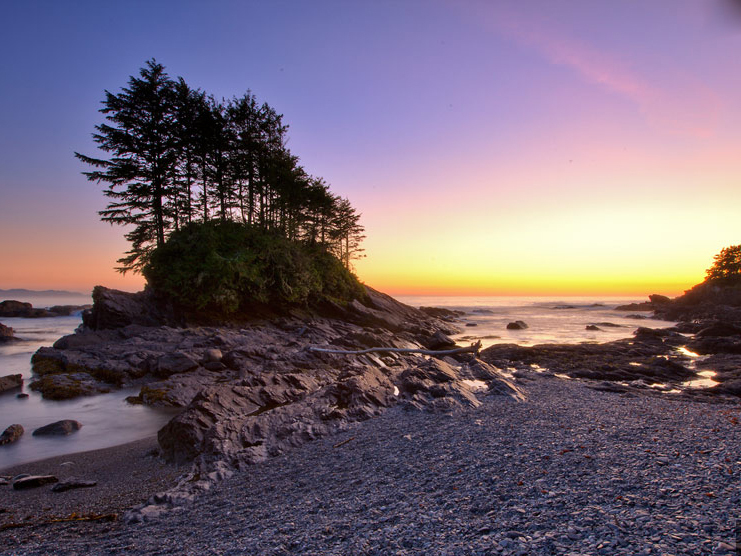 The region is so biologically significant that the University of Minnesota installed the first marine research station in the Pacific Northwest at Botanical Beach in 1901. Since then, the area has been used for research by a number of universities in BC and Washington. A low tide of just over one metre or less is best for viewing these tide pools. Use Canadian Tide Tables “Port Renfrew” section. Remember to add one hour to the listed tidal times during May to October as Daylight Savings Time is in effect. Impact of human activity on the intertidal area is of growing concern. When visiting Botanical Beach, please look in the tide pools only – do not touch the marine life. Do not remove, collect or disturb any tide pool life, shells, plants, flowers, kelp, etc. – they are all part of a vulnerable ecosystem that Botanical Beach was established to protect. Even touching the water in a tide pool with sunscreen on your hands can create an “oil slick” that could kill the vulnerable creatures in this sensitive ecosystem. Photographs make great souvenirs. The Botanical Beach day-use area offers parking, pit toilets, visitor information and picnic areas. While hiking on the trail, cars can be left overnight in the Botanical Beach parking lot. Please do not leave anything of value in your vehicle.